Since the All-Star Game is the proverbial midway point of the season, let's take a look at per game attendance trends of each Major League club, compared to last season. After the chart below, we'll try to make some sense of this. It's no surprise that the Marlins are at the top of their list, as their new ballpark - particularly the new location - has lead to increase ticket sales. The other thing we can infer from what we've seen this season is that the Marlins are near the top in the league in no-show's. It's reasonable to think that many people in South Florida caught Marlins fever this offseason, with the new ballpark and additions of Jose Reyes, Mark Buehrle, Heath Bell, and Ozzie Guillen, which led to increased sales of season tickets. The problem now, is that many of those people don't go to all of their games. As a season ticket holder for the Chicago Cubs, I can say that going to multiple games per week can become a chore. It's a process, but winning should make that easier, as well as transferring tickets to friends or buyers on the secondary market. The Tigers investment in Prince Fielder hasn't helped in the standings, but they've sold a lot more tickets. The Nationals are winning, and sitting pretty in first place. The Rangers are still glowing from winning back-to-back AL Pennants, as their ticket sales reflect improvements on top of improvements last season. Dodger fans in Southern California lifted their McCourt boycott, not that he's sold to Magic Johnson and Friends. Leading the division helps, too. As for the teams whose ticket sales are under-performing from last season, Minnesota probably has the worst 25-man roster in the big leagues. Compounding their performance, this is the Twins' third season in Target Field. So, the novelty of the new ballpark is beginning to wear off. Keep in mind, we're talking about attendance trends. While the Twins have the worst difference in attendance from last season to this one, they still rank 6th in the American League in per game attendance. Houston fans haven't been supporting the young Astros as much as we would have expected after their early season success. They lost 106 games last season. The team this year is playing better. The new front office is doing the right thing. Yet, they still haven't cracked 1,000,000 fans after 45 home games this year (9,992,220 tickets sold). Indians fans have even more to be embarrassed about. Also after 45 home games, their paid attendance is the lowest in baseball, with only 866,535 tickets sold. Making matters worse, they are only 3 games out of first place and still can't support the team. I'd say something cruddy about Cleveland fans right now, but I have too much respect for Joe Posnanski. The White Sox, Mets, Yankees, and Angels are also surprising to see trending downward. Chicago is in first place. The Mets are playing much better than 99% of people expected. The Yankees have the best record in all of baseball; their tickets are just too expensive. And, boy, did the Angels whiff on their attempt to make LA an Angels town. They had a higher per game attendance than the Dodgers last season, but are beneath them in 2012. 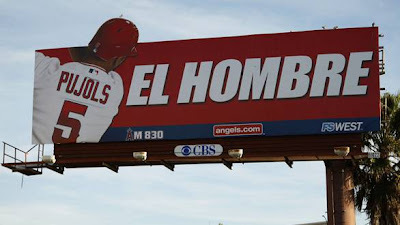 It's safe to say those bilingual Albert Pujols billboards wont be a case study for CBS Outdoor. Maybe AM830 got a bump in ratings from this advertising.